By entering the Catholic Charities of Northwest Florida (CCNWFL) cash giveaway opportunity drawing (the drawing), you consent to be bound by these Official Rules and Regulations. Accordingly, you should read these rules carefully before entering the drawing. 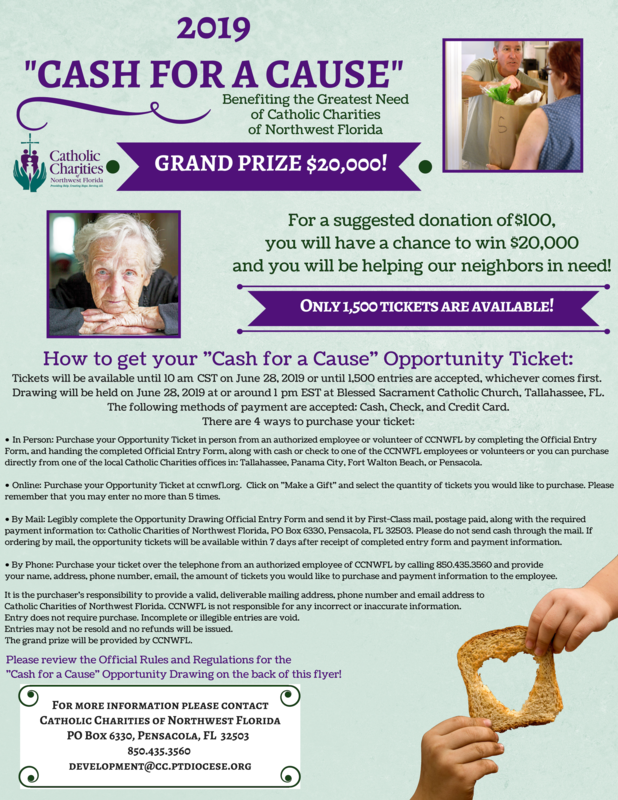 Organization Conducting the Cash Giveaway Opportunity Drawing: The drawing is being conducted by Catholic Charities of Northwest Florida, Inc., which is solely responsible for the drawing, the administration of these Official Rules and Regulations, and the awarding of the prize. This drawing is by chance in a charity drawing held in compliance with the State of Florida and is sponsored by CCNWFL, which is a qualified organization exempt from federal income tax pursuant 26 U.S.C. Section 501 (c) (3). The Grand Prize of $20,000 will be provided by CCNWFL. Net proceeds from this drawing will benefit the greatest need of CCNWFL. The Prize: The winner is responsible for all applicable federal, state and local taxes. Per current IRS requirements, the winner is responsible for payment of 24% withholding via form W-2G at time of acceptance. If the winner elects not to accept the cash, no substitution or exchange for other goods will be provided. Eligibility: Only residents of the United States 18 years of age (on or before June 28, 2019) are eligible to participate and enter. To be eligible to win, entries must be completed and received by CCNWFL in the format designated below. CCNWFL reserves the right to disqualify any entrant for violation of these Official Rules and Regulations, any applicable laws, or who makes any misrepresentations relative to this drawing of chance. Winner must have valid driver’s license or other official government identification with photograph. In Person: Purchase your Opportunity Drawing Ticket in person from an authorized employee or volunteer of CCNWFL by completing the Official Entry Form, and handing the completed Official Entry Form along with cash or check to one of the CCNWFL employees or volunteers or you can purchase a ticket from one of the local CCNWFL offices in: Tallahassee, Panama City, Fort Walton Beach, or Pensacola. Online: Purchase your Opportunity Drawing Ticket at ccnwfl.org. Click on “Make a Gift” and select the quantity of tickets you would like to purchase. Please remember that you may enter no more than 5 times. By Mail: Legibly complete the Opportunity Drawing Official Entry Form and send it by First-Class mail, postage paid, along with the required payment information to: Catholic Charities of Northwest Florida, PO Box 6330, Pensacola, FL, 32503. Please do not send cash through the mail. If ordering by mail, the opportunity tickets will be available within 7 days after receipt of completed entry form and required payment. By Phone: Purchase your ticket over the telephone from an authorized employee of CCNWFL by calling 850.435.3560 and provide your name, address, phone number, email, the amount of tickets you would like to purchase and payment information. It is the purchaser’s responsibility to provide a valid, deliverable mailing address, phone number and email address to Catholic Charities of Northwest Florida. CCNWFL is not responsible for any incorrect or inaccurate information. Incomplete or illegible entries are void. Entries may not be resold and no refunds or replacements will be issued. Odds of Winning:The odds of winning the Grand Prize will not exceed 1 in 1,500, but may be more favorable depending on the number of entries. If 1,500 submissions are accepted prior to the closing time of 10:00 a.m. Central Time on time on June 28, 2019, no further submissions will be accepted. Submissions received beyond 1,500 will be refused and, associated funds will be returned. CCNWFL shall randomly select from all accepted submissions received that day in order to achieve exactly 1,500 accepted submissions. Selection of and Notification to Winner:The final winner will be selected at a random drawing at Blessed Sacrament Catholic Church, 624 Miccosukee Road, Tallahassee, FL at or around 1 pm Eastern Time on June 28, 2019, by a representative of CCNWFL Board of Directors, whose decision shall be final and binding in all respects. Entrants do not need to be present to win. The winner will be notified by phone, certified mail, and/or e-mail, according to the contact information provided to CCNWFL at the time of entry. In the event a winner cannot be contacted, fails to respond within the required 14 day notification time frame, or fails to otherwise qualify for the prize and/or declines the prize, the winner designee will forfeit any rights to the prize. Upon verification of the winner and receipt of 24% IRS withholding from the winner, CCNWFL will award the prize to the winner. Affidavit & Release:As a condition of being awarded the prize, the winner designee shall be required to execute and deliver to CCNWFL a signed Affidavit of Eligibility, and satisfy IRS 24% W-2G withholding requirement. Use of Winner’s Name and Likeness:In consideration for being awarded and delivered the prize, the winner agrees and consents, without further authorization, compensation or remuneration of any kind, to the use of such person’s name and/or likeness in any and all advertising, promotions and other publicity in any media, worldwide, in perpetuity, except where prohibited by law. Taxes and Deductibility: All federal, state and local taxes associated with the receipt of the prize are the sole responsibility of the winner. The IRS currently requires income tax withholding of 24% on prize values of $5,000 or greater must be paid upon award and distribution. Government rules governing withholding can change without notice. CCNWFL will follow the rules in effect at the time the prize is awarded. The IRS has taken the position that amounts paid for chances to participate in raffles, lotteries or similar programs are not gifts and, therefore, the price of the entry does not qualify as a deductible charitable contribution. Check with your qualified financial advisor for additional information. Current employees of CCNWFL and family members of CCNWFL employee living in the same household as the employee. Governing Laws:This drawing by chance and these Official Rules will be governed, construed and interpreted under the laws of the State of Florida. All applicable federal, state and local laws and regulations apply. Offer void where prohibited. Fraudulently completed the entry form or provided other false information to CCNWFL. General Release:Each entrant releases CCNWFL, and any of their respective subsidiaries, affiliates, directors, officers, employees, agents and successors from any liability whatsoever, and waive any and all cause of action, for any claims, costs, injuries, losses, or damages of any kind arising out of or in connection with or as a result of participation in this drawing by chance and of the winner, in acceptance, possession or use of the prize (including, without limitation, claims, costs, injuries, losses and damages related to personal injuries, death, damage to or destruction of property, rights of publicity or privacy, defamation or portrayal in a false light, whether intentional or unintentional), whether under a theory of contract, tort (including negligence), or other theory. Trademarks:Any trade names, trademarks or service marks shown as part of the materials associated with this drawing by chance are the property of their respective owners. In no event, shall CCNWFL be liable to any party for any loss or injuries to earnings, profits, goodwill, or for any incidental, special, punitive or consequential damages of any person or entity, whether arising in contract, tort, or otherwise. Purchase your Cash for a Cause Opportunity Ticket Today! Click on the "Purchase Now" link to purchase your ticket online.